Missouri’s new livestock trespassing liability law will go into effect on October 15. The Legislature voted last week to override the Governor’s veto of the measure. Supporters, including State Representative Joe Don McGaugh (R-Carrollton), say the new law will shield responsible livestock owners from civil liability if their animals escape, through no fault of their own. 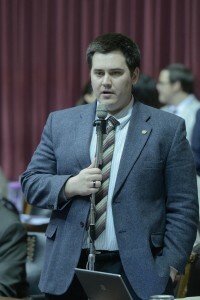 “My number one thing, and what people kind of overlook in this bill because it’s not what we talked about a lot, but was the ability of the individual whose property is trespassed onto to actually hold those animals ransom until the damages that they believe are due are paid by the animal owners,” McGaugh told Missourinet. McGaugh notes the new law he sponsored removes that provision. It will hold the animal’s owner liable for damages to another’s property if the animal owner was found to be negligent. McGaugh says all of the major commodity groups backed the bill. “Many other states that surround Missouri put in the issue of animal trespass and the way that they decide those issues is simple negligence, not strict liability, and that’s all the change did,” McGaugh says. The House override vote was mainly along party lines, but State Reps. Stephen Webber (D-Columbia) and Ben Harris (D-Hillsboro) voted with Republicans to override Governor Jay Nixon’s (D) veto. State Reps. Jay Barnes (R-Jefferson City) and Bill White (R-Joplin) voted to sustain the Governor’s veto. Barnes emphasizes the importance of property rights. “Because if you care about rural property rights, you can’t say that a livestock owner’s chattel rights should be greater than the rights of the neighboring rural property owner,” Barnes told his House colleagues last week, on the floor. Barnes says the previous law didn’t prevent Missouri from becoming a national livestock leader. He also suggested that the Missouri Corn Growers Association will be back before the Legislature in a few years, to try to reverse the new law.